You might not look at your home’s ductwork often, but it could be the cause of some energy loss! Your heating and cooling system depends on properly sealed and installed ductwork, so if your ductwork is improperly installed, the wrong size, dilapidated or even missing in some spots, your heating and cooling bills can be much higher than they should be. At H&S Heating And Cooling, we specialize in custom ductwork for homes and commercial buildings. We come out to your home and measure everything to make sure you get the perfect custom fit. 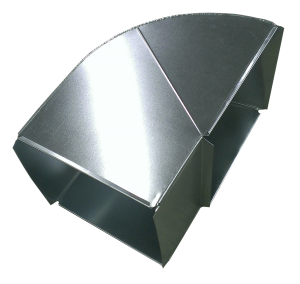 Our shop is equipped to fabricate high-grade metal custom ductwork quickly and accurately to save you money. H&S Heating And Cooling has nearly 30 years of experience in HVAC in central Minnesota. This experience has helped us learn how important it is to have properly sealed and installed ductwork to create energy and money savings. The waste associated with poorly done ductwork has much more of an impact on your energy bill than any other part of your home. Here are some points for you to consider as you look at your own ducts. Try to imagine blowing air through a large cardboard tube. Some air might come out the other end, but not with much force, and definitely not as much as you’re putting into it. Now imagine doing the same thing with a straw; pretty different right? Ductwork works the same way. Ducts which are too large requires more energy to push air through the entire system. If you don’t have any glaring problems with your ducts, the place where you still lose more energy than anywhere else is at the connective junctions (at the furnace, corners, vents.) It’s important to be sure these fit perfectly to cut down on the amount of air lost. By allowing H&S Heating And Cooling to improve your home with custom ductwork, you can avoid the larger energy bills which can come with choosing a “one-size-fits-all” system not designed to meet your specific heating and cooling needs. Contact us today to learn more about how we can help save you money and energy!